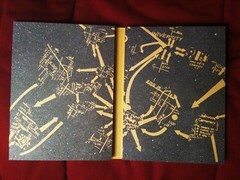 The interior packaging to the Criterion release of Richard Linklater's Slacker features a "Naked City"-esque map of Austin. The packaging by Marc English Design recalls the famous Situationist dictum "Ne Travaillez Pas"—a theme that also resonates with the idea of the film's eponymous slackers. Reason enough to purchase the edition, even if you didn't like Linklater. But who doesn't. It also seems almost Lynchian but not David, Kevin.